Paint colors remain an issue. Original colors are no longer made; original samples, if found, have faded. Finding and matching early Lancia paint colors is quite difficult. There is information on what colors were used, but typically Max Meyer numbers are given. I know of no conversion chart for them to current paints. Lechler (Europe) made a major committment in the early 1990’s to convert vintage paint colors to current numbers, and they maintain a pretty current listing. 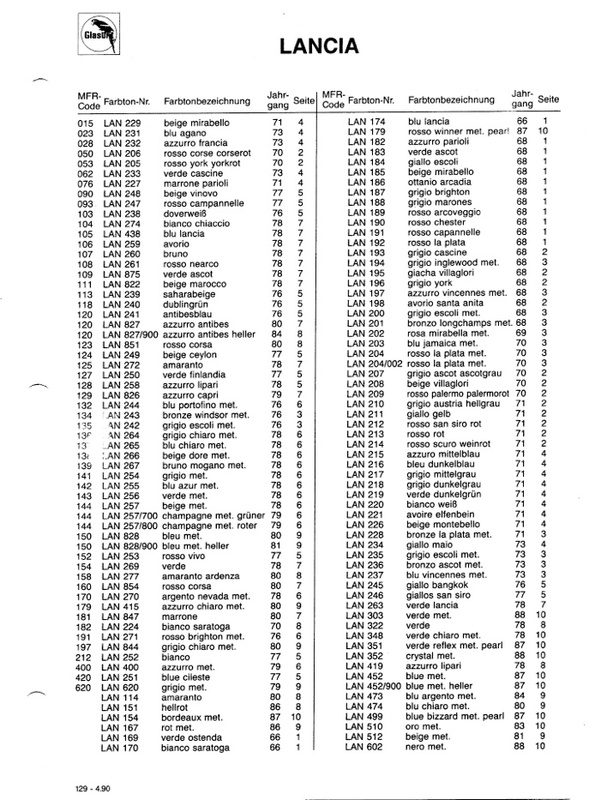 Their list from early 1990 is on this blog, dated 5.2/06. Unfortunately, Lechler is not represented in the US, and thus for the American, this is of little help (except for the friendly European, who sent paint swatches to me – thanks again!). Glasurit and PPG are much more common in the US. 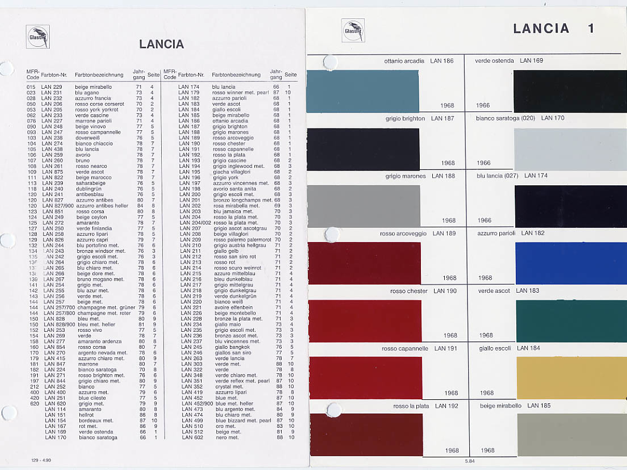 In 1990, Glasurit paint chip books had a section on Lancia and listed paint codes back to 1968, thus of use to US Lanciste. The first page (of eleven) is shown above – but rather than rely on scans for colors, one should use the name and number and have the paint made up – and see if you like it. There is a catch tho – some of the paints have slightly different formulas for different years! There are multiple listings for: blu Lancia, amaranto, beige mirabello and rosso corsa. Still, one can work from this number list and make pretty good progress. Thanks to Ed Levin (Fulvia, Los Angeles) for this information.